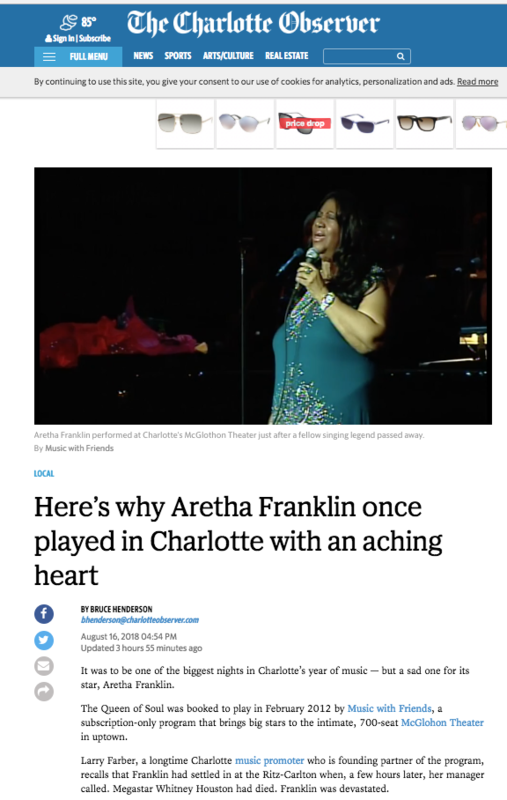 It was to be one of the biggest nights in Charlotte’s year of music — but a sad one for its star, Aretha Franklin. The Queen of Soul was booked to play in February 2012 by Music with Friends, a subscription-only program that brings big stars to the intimate, 700-seat McGlohon Theaterin uptown. Larry Farber, a longtime Charlotte music promoter who is founding partner of the program, recalls that Franklin had settled in at the Ritz-Carlton when, a few hours later, her manager called. Megastar Whitney Houston had died. Franklin was devastated. Franklin, in a 2017 interview, corrected reports that she was Houston’s godmother. That’s what happened. Farber recalls Franklin taking the McGlohon stage, seating herself at the piano and unleashing her emotions. Farber also chuckles at a Franklin peculiarity: She expected to be paid half her fee of more than $100,000 in cash before the show. That preference was likely based on her experience from earlier days, Farber said, when some club owners felt little compunction about cheating black performers. Most performers are now paid by certified check. Franklin’s pocketbook, stuffed with cash, went with her onstage and onto her piano.